Starting from the practice of hermeneutic phenomenological writing as it has been advanced by van Manen, this paper addresses the understanding of an 'experiential givenness' of the world as basis for our 'lived writing'; an understanding that is essential to the new phenomenological writer if s/he is to be part of the phenomenological writing process. As the ultimate givenness of the world is the basis of knowledge, we constantly strive to "reach out on life beyond itself" (Gadamer, 1960/1985, p. 62), and thus need the right language to let the phenomenological text speak. The phenomenological writer's understandings of the chiasm of world and self, the depth of phenomenological awareness, and the interlacement of ethic-aesthetical poetic writing, are qualities discussed as essential for the phenomenological writer to understand in a felt-sensed way in order to write a phenomenological text. A deconstructive approach to (pre)reflective phenomenological writing is put forth by provocatively asking what it means to be involved in, and profoundly enclosed with the "wordliness of the world" (Saevi, 2011a, p. 3). The radical hermeneutic phenomenological openness to what it means to be human and how to encounter the human givenness of phenomenological seeing and writing renders it possible for the writer's personal voice to evolve. This paper looks at questions of how students learn to write hermeneutic phenomenology. It asks whether it is possible to learn the practice of a "fine human science writing" (Henriksson & Saevi, 2009, p. 36), and wonders whether phenomenologists are "found rather than made" (van Manen, 1991, p. 172). It also ask how, if phenomenological writing indeed has transferable qualities, this type of radical 'seeing-feeling-reflecting' can be communicated to the student of phenomenological writing. The paper argues that if a text is to come forth as phenomenological, its creation is necessarily a slow and distinctive process. The paper goes on to ask why this is the case and attempts to understand the process. It also attempts to understand the nature of writing in hermeneutic phenomenology. The questions asked in this paper are reflected in the student writer's grappling with methods and language in order to produce a text that reveals the structures of lived experience material in ways that negotiate the tenuous balance between the singular and the universal and can be called hermeneutic phenomenological. This paper looks at the nature of these structures and asks how a radically reflexive and distinctive experiential vein can be identified in them. How do we experience being seen by others? Perhaps we are rarely fully aware of how others see us. But if we do become aware, then it seems to be of great consequence, especially if we are not sure of the full significance of the others' look. Something becomes visible, when it is not just "seen" but when it is made noticeable. In the preface to his autobiography "And yet we are human" the Norwegian author Finn Carling tells what it was like for him to speak for the first time on the radio about the experience of being physically disabled. Finn Carling had directed the "eyes" of his radio listeners to take regard of something that had thus far been disregarded, not paid attention to. And yet, it had been a secret that everybody could already see. In fact, talking of "an irrevocable disclosure" when everybody could see his bodily disability seems strange, but this is how Carling experienced that particular situation. So, how may one understand this kind of seeing of disability that is experienced as a disclosing of something that everybody can see? How can one disclose something that is already visible? Simply, it is a certain kind of attentive seeing: it is to make noticeable (and thus thinkable) what was only seen but not thought about. Looking back, I can see now there was an abyss between the first tenuous approximations of writing phenomenologically, when I vaguely had the felt-sense that something different had entered my writing, and the time of the publication of the text on the experience of being seen. I now ask what had happened to me that caused the shift in my writing. This raises further questions: How was the abyss bridged? Was it in fact bridged? What had shifted my view so that I was capable of writing a hermeneutic phenomenological text, while earlier I was not? What did I not see earlier that I saw now? How had the shifted occurred? According to Heidegger (1926/1962) phenomenology primarily signifies a methodological conception and thus expresses the 'how' of phenomenological research rather than the 'what' or the subject matter of the substance in focus. Phenomenology includes a tension between content and form that is not easily overcome. Van Manen (1997b), in accordance with Heidegger and Bachelard, employed a distinction between thematic and expressive dimensions of writing that indicates the difference between 'what' a text speaks about and 'how' the text speaks. For a phenomenological text to hold the necessary experiential qualities this distinction should keep the text in check. It is argued that if this tension does not constitute the phenomenological text, the echo of the experiential meaning of the lifeworld does not break through our taken-for-granted understanding of daily life. Phenomenology (as a phenomenon showing-itself-in-itself) and logos (as the representation of the phenomenon showing-itself-in-itself) are inherently related, phenomenology to Heidegger (1926/1962) is therefore a methodology that aims at letting "that which shows itself be seen from itself in the very way in which it shows itself from itself" (p. 58). This raises the question: What does this mean in terms of how students encounter the writing process of a phenomenological text? First of all, it means that there is a fundamental tightness between method and project in phenomenology. In addition, this tension includes the methodological and the subject matter equally. It also means that phenomenological writing requires more from writers than that they possess an adequate cleverness of writing or a special aptitude for research. Janicaud (1996) played on the difference between the English and the French interpretations of the term 'intelligence' and suggested that the approach of a phenomenologist to phenomenology should be en intelligence avec. The avec refers to rather elusive qualifications like "a close understanding of, and empathy towards, or a collusion with a set of phenomena, a situation, a person, or a group of people" (p. 52-53). The personal and existential encounter with phenomenology as a way of seeing that lets things show themselves in themselves is therefore possible only when phenomenology is practiced methodically. The method, however, can be characterized as minimal, subtle and unobtrusive, and it remains on the very edge of what traditionally is called research methods. The textual practice of this minimal method and its uncertain manifestations in writing is what might distinguish a good phenomenological text from one characterized as not good enough. The openness to the unforeseeable uniqueness of the experience, the deconstructive attitude to phenomenological exploration, and the fundamental slowness and even passivity that characterizes the phenomenological writing process require an understanding of the world and the self as interconnected. The term passivity, from the Latin passivus, refers to the capability of feeling or suffering (derived from pass-, pp. stem of pati, to suffer as in passion; http://www.etymonline.com). The attuned and passive living with the phenomena is a pathic dwelling that remains attentively open to the suffering of the other. The terms passive and pathic in fact stem from the same origin, and are both attentive to the other's experiential condition. To Merleau-Ponty (1948/1997), the lived experience of self and world is instantaneous, inseparable and simultaneous. This unity with the world and the things of the world in a certain understanding allows the world to 'speak' to me. Unless I am aware of this 'speaking' and attend to the language of the world, I cannot hear it, recognize it, or remain open to what is 'said'. In a way, we are what we see, and how we see the world has consequences for our knowing, feeling, understanding and experiencing. Somehow, the way I see the world is already a kind of relational practice. By the very seeing of the significance of the situation, I place myself at the core of the experience and, therefore, tend to act upon what I see (understand) (Saevi 2005). The seeing and acting go beyond any interest in the mere individuality of my seeing and acting, as phenomenology is neither a methodology of particularity nor of absolute universality. Van Manen (1997a) claimed that "phenomenology consists in mediating in a personal way the antinomy of particularity (being interested in concreteness, difference and what is unique) and universality (being interested in the essential, in the difference that makes a difference)" (p. 23). The phenomenological interest is to attempt to understand the implicit meanings of concrete human experience with the help of language, always in ways that establish the contact between the uniqueness and the universality of the phenomenon. The tension between the singular and the universal brings forth the indefinability of any description and interpretation of human experience, and resists the categorization and regulation of concepts. In scientific thinking and writing, as in the human sciences, language, poetry and prose fall short when trying to capture the evasive, imprecise, many-layered and eruptive meanings of the experience (Heidegger 1971/2001, 1968/2004, van Manen 1997a, 1997b). This is so simply because the unity of self and world, and the language we hold to interpret this complexity, can only insufficiently and contradictory speak of the experiential dimensions of life. Phenomenological inquiry possesses a different rationality that, in addition to the "criteria for precision, exactness and rigor" (van Manen, 1997a, p. 17), also has a nature unsuitable and reluctant to circumscribe and encompass scientific theoretical conceptions. This is why phenomenological classics tend to be written in a distinctive, often poetic-like style. In a sense, as van Manen (1997a) asserted, compared to exotic and future-oriented natural scientists, phenomenological inquiries also present rather modest results. Phenomenological researchers explore our everyday human experiences, and do not offer the reader any 'results', at least not in form of conclusions. In a phenomenological text, the text itself is the result, and the link between the text and the outcome cannot be broken without losing the meaning of both. The good phenomenological text does not write about the experience of a phenomenon, but rather writes the experience from the perspective of an 'insider', a subjective being that exists along with the experience. In other words, the phenomenological text presents a subjective experience that offers the reader a worldly coexistence (Luijpen 1960). Phenomenology does not really 'produce' anything theoretically new. Instead, it lets things show themselves. The phenomenologist's intent is to help "restore factical existence to its original difficulty" (Caputo, 1987, p. 1). In this way, phenomenology is a methodology of both destruction (Abbau) and entirety (Gesamtheit). Faithful to the difficulties of life (Heidegger) phenomenological destruction, or in Derrida's (1967/1998) term 'de-construction' of the phenomena of the lifeworld, is an 'undoing' of the taken for granted of the experiential world. The undoing of the phenomenon puts being as presence into question and holds it there. Caputo's (1987) echo of Heidegger's hermeneutic concern, "to raise the question of being and let it hang there and to resist the temptation to cut it down when it starts to look a little blue" (p. 1-2), is, in fact, also true to the phenomenological project as pursued by hermeneutic phenomenologists. The question that then needs to be looked at is how it is possible to be truthful to the difficulties of life in phenomenological reading and writing. In addition, questions need to be asked concerning what it means to deconstruct or undo the taken for granted while writing a phenomenological text. Fundamentally, the question is: How do we practice the hermeneutics of keeping the question open? Heidegger (1971/2001), to whom both phenomenology and deconstruction owe a great deal, claimed that "language speaks" (p. 188). Language, not I, nor the novice phenomenological writer, says something. Instead, it is the language that constitutes the text itself that speaks. Speaking means letting something emerge, letting something show itself, by naming some thing as something. Therefore, to name some thing is to frame and delimit it, and to give this some thing a definite meaning. The tension between the intimacy of the world and the thing and the distinction between them, this dissociation that is necessary for a relation to exist between them, is a deconstructive phenomenological quality that might be called "the relationless relation" (Levinas, 1969, cited in Caputo, 1997, p. 14). It is therefore possible to ask what consequence the 'speaking' of the language has for the process of writing a text. Heidegger (1971/2001) again might bring us closer to an understanding. He wrote: "To discuss language, to place it, means to bring to its place of being not so much language as ourselves: our own gathering into the appropriation" (p. 188). The ethic-aesthetic dwelling with language both defines who we are and how we relate to ourselves, and thus constantly interrupts our sense of identity, or, as Derrida (1984) claimed, "identity presupposes alterity" (p. 117, emphasis in original). Understanding something is intertwined with the structures of life, and is, as Gadamer said (1970) "... the primordial givenness of our world orientation, and we cannot reduce it to anything simpler or more immediate" (p. 87). Our direct, incorporate, sensational, and linguistic contact with the world, in the centripetal dynamics of interpretation (and misinterpretation) (Derrida 1977/1988), is simultaneously a subjective and an intersubjective responsive to the vocation of the text. The "response to a call" (Derrida, 1984, p. 118) is not primarily an epistemological interpretive response in order to produce knowledge, but an encounter with the otherness of the text, and the otherness of self and world. Otherness is indicative of the novel phenomenologist's aptitude to sense the distinction between self and not-self, and to address the possibility of alternating experiences and inexpressible expressions in seeing and writing. This discussion then leads to the question of what a disruptive speaking of language means to the new phenomenological writer. At least two invariable qualities of writing phenomenology can be immediately recognized. First, there is the feature of the uniqueness or radicalness of the writing process as well as of the final paper. Second, there is the required pace of slowness and a certain passive reflecting/ writing/ reading attitude of the writer. The phenomenological writer, at any point of the writing process, may impose themselves as an instrumental conception of understanding, and is also tempted to treat herself as such an instrument (Heidegger, 1959). So the question is how to resist this imposition and to remain flexible and open. The pace of the writing process must be sufficiently slow to allow for the writer to dwell with that which addresses her. It is given the time and space to 'show itself-from-itself'. The search for the uniqueness of the experience by dwelling in slowness and passivity presupposes a rhythm of constant flux and reflux, as well as a kind of 'blindness' to preordained language, assumptions and concepts. Phenomenological writers learn to dwell comfortably in the space of hesitation. By going to the source of the experience and searching for the origin of the phenomenon, the writer adopts a radical, pre-reflective stance that resists the fast and easy way out of the difficulties of writing. The hermeneutic attitude requires the writer to 'dwell' with the phenomenon, to be open and to stay open to the uniqueness of the experience and of the language that emerges to describe the experience. This dwelling includes an attentiveness to self-withdrawal that prevents the writer from standing in the light of the experience. The attention waits, as Blanchot (1969) notes, letting the meaning of the experience unfold into a necessary but always insufficient language. To the Greeks, knowing something was to uncover its being. They called this uncovering aletheia, which can be translated as truth or, literally, as 'unconcealedness' (Heidegger, 1982/1989). We pass along the things of the world. We inhabit these things as they alternate between self-disclosure and self-concealment of what they are. To Heidegger (1971/2001) the beauty of things, beauty as meaningful presence, shows traces of truth. Somehow truth and beauty, like a chiasm, exist as parts of the same experience. When a thing reveals to us "the is-ness of what it is" (Heidegger, 1971/2001, p. 79), this thing appears to us as true. However, the truth is also of a kind that, now and then, obscures itself to us. The permanent double latency of the human experience presupposes slowness, passivity and a dwelling attention in the encounter with the phenomenal world. We do not possess the supremacy over things; rather we are the "dative of manifestation" (Sokolowski, 2000, p. 44). We may only seek to grasp the is-ness through iconic language that attempts to point to the essence of the thing we hope to describe. Therefore, phenomenological writing, like deconstruction, is the constant search for that which is basically undoable or impossible. It is writing sustained by the awareness of the ubiquity of language, and by the shift of the nourishing qualities in the language of understanding and misunderstanding. The indecisive and open-ended encounter with the undisclosed and unidentified phenomenon must be slow and attentive because phenomenological language does not include self-contained names and concepts that can initially separate and define the phenomenon. On the contrary, phenomenological writing is characterized by a certain willed dwelling that intends to let the things be in their otherness so that they, as much as possible, might stay unabsorbed by our conscious stream. Attention, as Blanchot (1969) noted, "waits without haste, leaving empty what is empty and avoiding but the haste, the impatient desire and even more, the horror of void that prompts us to fill the emptiness prematurely" (p. 174). In order to be addressed personally by that which is unknown, different, other, paradoxical, the 'not me', a radically willed dwelling, is required. The writer must simply let the things of the world be "in the ineradicable lethe from which all things spring up and to which they return" (Caputo 1987, p. 270). The meticulous and watchful practice of a minimal method, as well as the apparently opposite, the structures of an evocatively open and spontaneous reflection in phenomenology, cannot be taught either in teaching or writing. The gentle endeavor to write a phenomenological text is in fact the attempt to do the impossible, while not letting the impossible be wiped out by its impossibility (Caputo 1997). Understanding as "felt - sense"
Merleau-Ponty (1948/1997) held that, experientially, the human body is made of the same flesh as the world and is shared and reflected by the world. The two are in a relation of lived transgression and overlapping. He said: "The feeling that one feels, the seeing that one sees, is not a thought of seeing or of feeling, but vision, feeling, mute experience of mute meaning" (p. 249). The lived simultaneity of world, body and self is functional, and not only an ephemeral feeling. The felt sense of interconnectedness creates a "pregnancy of possibilities" (p. 249), which allows for a variety of understandings and interpretations of life. The limitless phenomena of the world can be explored when we realize that consciousness is consciousness "of" something that is not locked within its own cabinet (Sokolowski, 2000, p. 13). An awareness of the world as we experience it reflectively and pre-reflectively, a sense of the infiniteness of phenomena, and a feeling of the inherent relationship to this phenomenological world are all liberating for a phenomenologist. They open up a world of possibilities. The articulation and actualization of these possibilities occurs when the phenomenon offers itself in a certain light so that it can be seen. Sokolowski (2000) reminded us that "Language gives us an enormous reach as we can talk [and write] about things long ago and very far away, even about galaxies that are incredibly distant from us and periods of time billions of years ago" (p. 96). As human beings we can perceive, remember, imagine, anticipate, and dream of things, experiences and persons - these are intentionalities that are not ordered syntactically like words, but are fleeting, unspecific and evasive. This is why human experience is experientially lived and is a rich source for phenomenological reflection. The novice phenomenological writer must be part of this world of intertwined lived- and living-ness, and in her writing and reading must have "a feeling for the difference between the natural attitude and the phenomenological attitude" (Sokolowski, 2000, p. 56). S/he must have a sense of the difference between the felt sense of the possibilities of some thing, and the actual social-realistic self-present 'fact' of what something is in a de facto manner. Barthes (1984/1989) touched on this textual challenge of phenomenology when he wrote: "Science speaks itself; literature writes itself; science is led by the voice, literature follows the hand; it is not the same body, and hence the same desire, which is behind the one and the other" (p. 5). However, for hermeneutic phenomenology, interestingly enough, it is the same body and desire. Through the hand we indeed wish to give voice to that of which experience speaks (Henriksson & Saevi, 2009). One of Sartre's projects that is particularly relevant in making this point involves his description of the difference between being on the inside and not being on the inside of an event. When being on the inside of an event one is not thinking of the event. To live a story and to tell a story are different experiences. Murdoch (1953) wrote, referring to Sartre that "one can live or tell; not both at once" (p. 11). Thus, telling or writing a lived experience is to recall the lived in the shape of a memory. The retrospective element of phenomenology, the constant act of looking beyond what is currently at hand, experientially establishes the distinction in phenomenology between appearance and essence, facticities and facts (Henriksson & Saevi, 2009). Sartre (1949) argued that we should "give up the impossible dream of giving an impartial picture of society and the human condition" (p. 23). I would argue that then, and only then, can writing phenomenologically be a strenuous pleasure that challenges the strength of our attention (Weil, 1990), while maintaining the shared, yet disruptive, and potentially transformative differences in our common lifeworld. When something disrupts us, we have difficulties in letting it go. We see and hear it everywhere, as if it has punctuated into our day life in ways that are meaningful to us, but may hold completely different meanings to others. Disruptions somehow give us the persistent pleasure of trying to sort out what was calling for our attention. Only in the tension between the partial experience and the impartial - we strive to understand but we can never capture the whole - can we escape the grip of a self-evident and self-present language that masters and directs everything we think and write. Writing phenomenologically is the transitional practice of going beyond the abstract, conceptual 'label-language' and involves the attempt to let experience reverberate immediately beyond everything we think we already know. Writing phenomenology can never simply be "to iterate what is already given and understood in lived experience in the way that it is given and understood" (Burch, 1989, p. 4). On the contrary, writing phenomenology is the approval of perceptive and linguistic non-transparency, not to end up seeing nothing or simply seeing through everything and making the world and our lived experiences transparent or invisible (Lewis, 1943/1986). The constant struggle of "re-achieving a direct and primitive contact with the world" as Merleau-Ponty (1945/2002, p. vii) claimed is the endeavor of transcending the natural attitude to things by going beyond their transparent obviousness. The direct contact with the world is a restoration of "the factical existence to its original difficulty [... and] an attempt to stick with the original difficulty of life, and not to betray it with metaphysics" (Caputo, 1987, p. 1). The willing ability to re-achieve contact with the world (and to accept its radical unforeseeable and paradoxical complexity) presupposes the dwelling, the responsible attentiveness, addressed by Blanchot (1969) and by Simone Weil (1990). This seemingly passive attentiveness is vital to the phenomenological attitude because "Attentiveness is to let the thought be free, to let it be open and accessible to the object [...] empty, not searching for anything, but ready to accept the object in its naked truth" (Weil, 1990, p. 74-75)1. The openness of thought and the waiting willingness to receive and let in something new, something that was not there before, but without impatiently filling the empty voids, characterize a phenomenologically responsible and responsive attitude. Attentiveness goes beyond and precedes thought, and is a breath of outlook that partly dwells in itself, partly sees beyond, and persistently avoids the tendency to totalize, manage and control. Phenomenological writing is a kind of de-constructive practice because of its "openness towards the unforeseeable" and its "affirmation of what is wholly other" (Biesta 2001, p. 33). Like deconstruction, hermeneutic phenomenology "has to be understood in its occurrence" [...] as "an attempt to bring into view the impossibility to totalize the impossibility to articulate a self-sufficient, self-present center from which everything can be mastered and controlled" (Biesta, 2001, p. 46-47). Phenomenological writing shares with the practice of deconstruction the aim of an ethic-sensitive openness toward that which comes into being as it comes into being, and a practice of writing that intends to responsibly respond to the possibility of the otherness of the phenomenon and of the Other. Derrida (1991/1992) asserted that "the condition of this thing called responsibility is a certain experience and experiment of the possibility of the impossible; the testing of the aporia from which one may invent the only possible invention, the impossible invention" (p. 41, emphasis in the original). Hermeneutic phenomenology as a writing practice (van Manen, 2002, 2006) is concerned with the radical difference in the experiential world, the lack of homogeneity of meaning, and the fundamental impossibility of writing as 'presentative' act. The incalculable complexity of the phenomena of the world addresses the otherness of the other, and presupposes a dwelling, but also incalculable intersubjectivity, as its experiential basis. As a practice, hermeneutic phenomenological writing is characterized by "the relentless pursuit of the impossible, which means, of things whose possibility is sustained by their impossibility, of things which, instead of being wiped out by their impossibility, are actually nourished and fed by it' (Caputo, 1997, p. 32, emphasis in the original). Like deconstruction, hermeneutic phenomenological writing dissociates itself from writing as a representative act, and rejects the modern idea that language can grasp meaning by turning it into seemingly self-explanatory and self-identical concepts. Language as writing does not primarily demonstrate identity between word and object, but rather is the profound ambivalence of meaning, or, as Biesta (2001) phrased it, "an undecidability which cannot be traced back to some original pure unity, but which itself is always already 'at work'" (p. 36). Therefore, in order to try to do justice to the phenomenon the response of hermeneutic phenomenological writing must "prepare for the incalculable" (Derrida, 1997, p. 17). Hermeneutic phenomenology, as is prototypically practiced by the members of the Utrecht School, is known for three qualitative features that are recognizable in their writing: the choice of everyday, familiar and situational subjects; the use of experiential material in the texts; and an unconventional writing style (Henriksson & Saevi, 2009). This writing style might be described through Heidegger's (1971/2001) term Dichtung, which has a wider meaning in German than its equivalent in English, poetry. The term refers more broadly to the concrete and situated activity of writing as invention or change and not only to the poetic product or the poem. This focus on the text and on writing as a transformative, or even a disruptive, activity shares traits with de-constructivist writers like Jacques Derrida and Helen Cixous. Dichtung applies to the concrete practice of all creative, original writing, and considers the process of sensing, writing and thinking prior to the success of the result. The artist's open, inventive and often conflicting process of writing, demands a willed slowness and dwelling of sensation and thought. To Heidegger (1971/2001), there is kinship between poetic language and thinking, although he noted that "the poetic character of thinking is still veiled over" (p. 12). Thinking's inability "to say that which must remain unspoken" is what "would bring thinking face to face with its matter" (p. 11). Perhaps the reason the process of Dichtung is so important is because it is here, in this challenging activity, that the writer is confronted with a sensing/ thinking/ writing that is essentially undoable, impossible and unsuccessful, as a (re)presentation of the utmost complex and multifarious experiential world in which we live. The practical-ethical-aesthetic writing style calls for a responsible writer who dwells poetically and expressively in existence as well as in writing. The sensibility required to engage with a language that resonates with experiential meaning comes precisely from the way we dwell with the things of the world. As readers, we may feel addressed by texts that stir up the sensations of lived experience, be they poems or phenomenological texts, because they echo meaningfulness and "evoke[s] in us recognition or thoughts which are new and at the same time conversant" (Henriksson & Saevi, 2009, p. 49). The resonance between the experiential meaning of the phenomenon expressed in the evocative language of a phenomenological text and the lived sensibility of the self and world of the reader might create a moment of contact between writer and reader. The asynchrony of the contact, however, means that an intersubjective and interdependent dwelling might occur unnoticed and therefore unrealized in its transformative power. The inseparable relation between things, world, human being, and language is the reason why the evocative writing style of hermeneutic phenomenology speaks to us precisely in this tension between the pre-reflective and the reflective, and thus truly is the practice of incalculable ethic-poetic writing. Arendt (1981) suggested that "there is nothing in the ordinary life of man that cannot become food for thought, that is, be subjected to the twofold transformation that readies a sense-object to become a suitable thought-object" (p. 77-78). The shift from the 'undoable' ethic-poetic writing of hermeneutic phenomenology, to the situated and earthbound qualities of Olav H. Hauge's (2008) poem The Scythe, might consolidate interconnected but also distinctive linguistic practices, all of which explore the relationships between human beings, things and world. I keep to the scythe. Hauge's (2008) concrete, imaginative poetry prefers pointed images and un-abstracted language to emotional and symbol-laden expressions, and focuses on the thing as thing, rather than as a symbol for something more abstract. Both Hauge's poetry and hermeneutic phenomenological writing hold these qualities in common - qualities which might be called presentational, rather than representational. When language creates evocative images, like Hauge's poems, then the proximity to the artistic practice of hermeneutic phenomenology is striking. Hermeneutic phenomenological writing has a clear affinity with Gadamer's (1977/2002) notion of "transitional cases that stand between poetically articulated language on the one hand and the purely intentional word on the other" (p. 67). In the writing of hermeneutic phenomenology, language is not primarily a means to an end. Instead, linguistic engagement is an end in itself, in which a world is created, challenged, and confirmed - although it is always open-ended. In ethic-poetic writing and thinking, the world appears to me as a particular givenness, a presence of giving as a caring act, as well as a commonly experienced inter-relatedness and inter-subjectivity. This world, as it is the object of both sensation and thought, evokes questions rather than answers. As Lingis (1994) noted, "One identifies oneself and maintains one's own identity in the midst of things" (p. 124). The writing phenomenologist is "a passageway" (Heidegger, 1971/2001, p. 39) to the work, and the work itself might lead the writer and the reader to an experiential 'lighting' where the partly concealed meaning of the text is at work. The is-ness of the thing is not a representation of a corresponding object that we can verify by matching the depiction correctly to the object depicted. The is-ness of the thing is not fully accessible to us, but is constantly alternating beyond human control and prediction. As Heidegger (1971/2001) noted, "There is much in being that man cannot master. There is but little that comes to be known. What is known remains inexact, what is mastered insecure" (p. 51). In the midst of things, situations and events, there are spaces, openings, and rifts, and it is in these gaps of interpretation and understanding that "truth happens" (p. 56). The gentle encounter with the otherness of world, text, other and self, addresses the fundamental hesitation needed for the beginning phenomenological writer to be sufficiently attentive to the ruptures, contradictions and twists of language, seeing and writing. Seeing as understanding, and understanding as a felt-sense of the intertwinement between one's own lived-being and lived-writing, is the necessary response from the phenomenological writer to the 'call to be written' of the things of the world. As Lingis (1994) reminded us: "The nonthings in which things form are what Levinas has thematized as the elemental" (p. 122, emphasis in original). Textual sensibility knows these elementals and relates them meaningfully to experience. This felt-sensed recognition of the ontoethical elements of what we might understand as the 'nonthings' or the unidentifiable lived and living rudiments of our lives, might be what reverberates both when the quiet scythe sings in the grass without hurting, as Hauge says, and also when the novice phenomenologist addresses a worldly and 'wordly' phenomenon in writing. 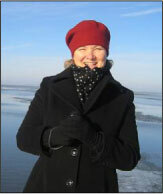 Dr Tone Saevi, PhD, is a phenomenologist associated with The Utrecht School of Phenomenology. She currently teaches Continental Existential Education and phenomenology at the School of Education, NLA University College, Bergen, Norway. E-mail address: ts@nla.no. 1 Oppmerksomheten består i å slippe tanken løs, la den være tilgjengelig og åpen for objektet [...] tom, ikke på jakt etter noen ting, men rede til å motta objektet som skal komme i dens nakne sannhet (Weil 1990, s. 74-75).